When I think of Portland, Oregon, I think of friendly faces (three of my closest friends are either currently living or were raised in Portland) pine trees, fresh air, good coffee, and experimental food with local flavors and a whole lot of heart put into it. Portland is one of my favorite places to visit in the US and if you haven’t been yet, put it at the top of your list for travel in 2019. I hope you find this guide helpful- it includes some of my favorite places to shop, eat, and hike. If you’re local to Portland or have another favorite to share, please add it in the comments so we can keep the conversation going and the delightful food recs a-comin’. Palace is your one-stop-shop for all things fun, funky, beautiful, well-made, and gifty. I was first introduced to this store by my girl Alison Wu this past summer. I’ve had my fair share of concept stores across the country, and I was pleasantly surprised when I walked in and saw such a wide variety of items and goods at varying costs. When I walk into most concept stores, I expect many of the items are going to be out of the range I feel comfortable purchasing, and that’s ok. I still find tremendous pleasure in browsing, gathering inspiration, buying gifts for friends, and the occasional well-researched splurge on myself. But at Palace, you could find things starting as low as $3. Knit beanies for $12. Bravo, Palace. My first time there I bought a moon book, socks, a hat, and a ceramic plate for my incense. I went again the very next day and bought this perfume. I love this store and wish they’d operate in LA, but I guess that is part of the Portland appeal, eh? I didn’t get food here, but the interior is adorable and it’s a newer gem in the Portland cafe scene. I ordered an almond milk latte and sat at the window bar tables so I could gaze outside and watch the November rain wet the Portland sidewalks. I enjoyed the ambiance of the space and all of the plants, of course. I went on a Monday around 10am, and it was JAM PACKED! I could hardly find a seat, but I assume it’s because it’s so cute in there. Find a friend and stop here for a warm tonic, macro bowl, toast, pastry, or juice. Where do I start? My love for Root Whole Body is limitless. I love everything here. Yeah, you heard me. Their menu selection is insane. 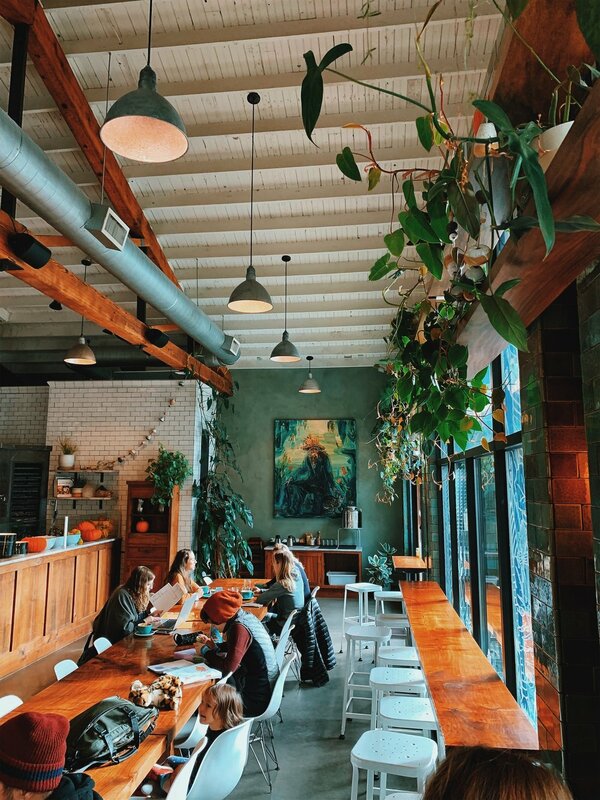 From the dense herbal tea selection, to the warm bowls in the winter, to the cool bowls in the summer, it’s a must-visit every time I am in town. Most recently, I tried their yellow curry bowl with chickpeas, brown rice, and veggies. I also got an almond milk matcha, mushroom broth, and a roasted veggie salad with cashew cheese chèvre. Root Whole Body also has a spa and wellness center attached to it, so you can treat yourself to a facial or massage, then rebuild your stamina with a bowl right after. When I first ate at Tusk, I seriously considered starting a petition asking them to open in LA. Their unique blend of flavors, seasonal ingredients, and millennial pink branding has got me all heart-eyed and bushy-tailed. You can always expect to be surprised at Tusk. It’s not your average run-of-the-mill, trying-to-be-healthy, boring place. It’s quite the opposite. We went here for the VIP dinner post workshop, and I got their puffed rice salad and charred beet dish. Everything was to-die-for. Next time, I have to try their brunch. A classic for the Portland health conscious. Gluten free? Check. Wide variety? Check. Plant based? Check. You can’t go wrong at this established place. They have comfort foods like mac and cheese and green hot chili cakes but also have mushroom lattes, rancheros, roasted veggie bowls, and chilis. Order to-go, or stay in and chill. A sprawling 5,200-acre park with everything you could ask for: trees, trees, and more trees. Just being near the park, the air already smells fresher. Take a forest hike with family, or go for a solo run with just the sounds of nature. You can’t go wrong in this beautiful park Portland has to offer. No trip to Portland is complete with a stop at this ice cream place. They make real, organic, non-dairy soft serve with real ingredients— ones that you can see and taste. They also offer an assortment of gluten free toppings and syrups. Have you been to Portland, OR? Let me know your favorite places below!